/mo. Requires 2-year agreement, enrollment in Autopay and E-bill . Pricing, speeds, and availability vary by location. Choose CenturyLink Business Core Connect 20 Internet and unlimited long distance phone service bundled for one low price. CenturyLink Business Internet 20 offers download speeds up to 20 Mbps, good for powering through high-demand online tasks and jobs along with unlimited local and long distance saving time and money. Power up your office suite with CenturyLink Business Core connect 20 Bundle. This choice of CenturyLink Business Internet gives you up to 20 Mbps download speeds for high-demand online tasks. This one connection easily supports multiple users at the same time. Unlimited local and long distance calling with multiple calling features keep on budget. Call today and start saving. Available to new high-speed internet business customers only. Other fees and conditions may apply. **Free activation does not include DSL installation. Speeds may vary by location. Requires a 36-month term agreement. Pure Business Internet offer available for a limited time. Listed rates includes High-Speed Internet that requires a 24-month-term commitment (after which the rate reverts to the then current standard rate) and enrollment in CenturyLink AutoPay and electronic billing service within the specified promotional timeframe to be eligible for rate. An additional monthly or flat fee, installation fee, and separate shipping and handling fee may apply to customer's modem or router, depending on HSI package and options selected. Early Termination – A $200 fee will apply to early termination of the High-Speed Internet service. General – Services and offer not available everywhere. Business customers only. CenturyLink may change or cancel services or substitute similar services at its sole discretion without notice. Offer, plans and stated rates are subject to change and may vary by service area. Requires credit approval and deposit may be required. Offer may not be combined with other offers. Additional restrictions apply. Terms and Conditions – All products and services listed are governed by tariffs, terms of service, or terms and conditions. Products and services are provided by the CenturyLink operating company serving your service location. Taxes, Fees and Surcharges – All prices exclude taxes, fees and surcharges, which apply to all services, and include federal and state-mandated and permitted charges, cost recovery charges, state and local fees that vary by area, and certain in-state surcharges. Cost recovery fees are not taxes or government-required charges for use. Additional charges apply depending on services selected, including a carrier Universal Service charge, federal regulatory recovery fee and property tax fee, a one-time High-speed Internet activation fee, a one-time voice service activation fee, extended area service charges, monthly zone increment charges, and connection fees. Taxes, fees, and surcharges apply based on standard monthly, not promotional, rates. Depending on your location, promotional discounts may not apply to first partial month of service. High-Speed Internet – Customers must accept High-Speed Internet Subscriber Agreement or Business-Class High-Speed Internet terms and conditions, as applicable. Listed broadband speeds vary due to conditions outside of network control, including customer location and equipment, and are not guaranteed. Telephone landline is part of the service only for the purpose of data traffic transmission/connection and cannot be used for voice traffic transmission, except for 911 services. Price Lock – Applies only to the monthly recurring charges for the 36-month term for the listed services; excludes all taxes, fees and surcharges, monthly recurring fees for modem/router and professional installation, and shipping and handling fee for customer's modem or router. Offer requires customer to remain in good standing and terminates if customer changes their account in any manner, including any change to the required CenturyLink services (canceled, upgraded, downgraded), telephone number change, or change of physical location of any installed service (including customer moves from location of installed services). Microsoft Office 365 – Customer will receive subscriptions to use the products on the specified number of PCs during customer's subscription term with CenturyLink, which begins upon initial installation and activation of the product. These services are subject to acceptance of the terms and conditions included with the product. Features may be added, modified, or removed during the service period and customer should install updates when they become available. Office 365 is designed to work with the current or immediately previous version of Internet Explorer or Firefox, or the latest version of Chrome or Safari. 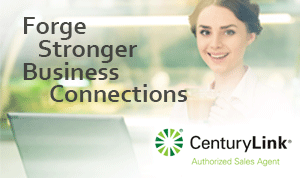 CenturyLink Business Bundle offer available for a limited time. Listed bundle rate includes High-Speed Internet, unlimited local and domestic long-distance calling and listed features, and requires a 24-month term commitment after which the rate reverts to the then-current standard rate) and enrollment in CenturyLink AutoPay and electronic billing service within the specified promotional timeframe to be eligible for rate. An additional monthly or flat fee, installation fee, and separate shipping and handling fee may apply to customer's modem or router, depending on HSI package and options selected. Early Termination – Monthly rate applies while customer subscribes to all qualifying services. If one (1) or more services are terminated, the standard monthly fee will apply to each remaining service and depending on your service location, either a $200 fee will apply to early termination of the High-Speed Internet service or an early termination fee will apply in an amount up to $400, prorated for the number of months remaining in the term. General – Services and offer not available everywhere. Business customers only. CenturyLink may change or cancel services or substitute similar services at its sole discretion without notice. Offer, plans and stated rates are subject to change and may vary by service area. Requires credit approval and deposit may be required. Offer may not be combined with other offers. Additional restrictions apply. Terms and Conditions – All products and services listed are governed by tariffs, terms of service, or terms and conditions. Products and services are provided by the CenturyLink operating company serving your service location. Taxes, Fees and Surcharges – All prices exclude taxes, fees and surcharges, which apply to all services, and include federal and state-mandated and permitted charges, cost recovery charges, state and local fees that vary by area, and certain in-state surcharges. Cost recovery fees are not taxes or government-required charges for use. Additional charges apply depending on services selected, including a carrier Universal Service charge, federal regulatory recovery fee and property tax fee, a one-time High-speed Internet activation fee, a one-time voice service activation fee, extended area service charges, monthly zone increment charges, and connection fees. Taxes, fees, and surcharges apply based on standard monthly, not promotional, rates. Depending on your location, promotional discounts may not apply to first partial month of service. High-Speed Internet – Customers must accept High-Speed Internet Subscriber Agreement or Business-Class High-Speed Internet terms and conditions, as applicable. Listed broadband speeds vary due to conditions outside of network control, including customer location and equipment, and are not guaranteed. Microsoft Office 365 – Customer will receive the Business Essential plan with subscriptions to use the products on the specified number of PCs during customer's subscription term with CenturyLink, which begins upon initial installation and activation of the product. These services are subject to acceptance of the terms and conditions included with the product. Features may be added, modified, or removed during the service period and customer should install updates when they become available. Office 365 is designed to work with the current or immediately previous version of Internet Explorer or Firefox, or the latest version of Chrome or Safari. Business Phone – Includes 1 business phone line with direct-dial local and nationwide voice calling, designated calling features and unlimited nationwide long-distance service, including all U.S. territories and possessions; excludes data and facsimile services (including dial-up Internet connections), conference lines, directory and operator assistance, chat lines, pay-per-call, calling card use. Restrictions on number of local and long-distance packages/plans per account apply. Customer may subscribe to a maximum of ten (10) lines per location. Usage may be monitored, and customer may be required to show compliance if usage exceeds 3,000 minutes/mo. or non-compliance indicated. International calling billed separately. A router is a hardware device that routes data from a local area network (LAN) to another network connection. The most common types of routers are home and small office routers. They pass data like email and webpages to your computer from the internet.